Changing your smile is a big deal. Thanks to Invisalign, the process doesn’t have to affect your professional and personal life like metal braces would; but it will alter your daily routines and habits. The idea of wearing clear aligners all the time might make you a little nervous at first, but once you get a few weeks into the treatment, you’ll be an expert. Find out more about the benefits of Invisalign treatment and your exciting future with your new smile! When an adult wears metal braces and wires, other people often comment on them. They may ask sincere questions or make jokes, but either way, the braces are there— they are noticeable, so they become a topic of conversation even if the wearer would rather not discuss them. When you’re wearing Invisalign, most people will never know. The aligners are so clear that they’re practically invisible. Unless someone is standing right in front of you, staring at your teeth, they probably won’t notice anything different about your smile. 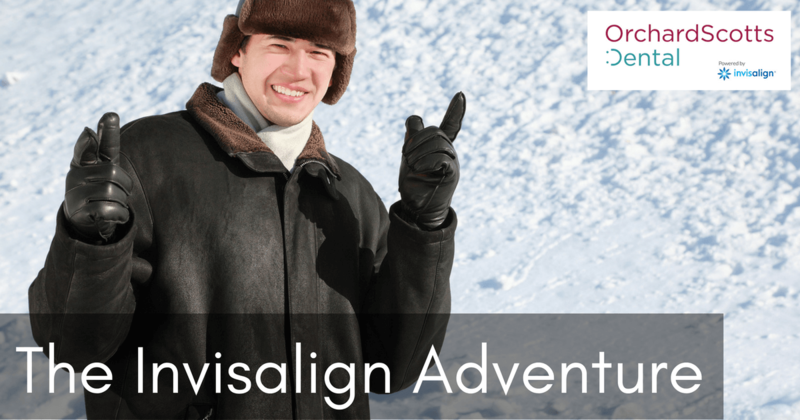 If you consider yourself to be a disciplined person, you’re a good candidate for Invisalign. People who care about perseverance, excellence, and self-discipline make great Invisalign patients, because they take their treatment seriously. They wear their aligners all the time, except when eating. They brush and floss their teeth thoroughly after meals before replacing the aligner trays. They do the work, and they get results. Since you’re supposed to wear your trays for 22 hours per day, you’ll only have 2 hours remaining in which to eat and drink without the aligners in your mouth. When they’re in place, you’re only allowed to have water. Coffee and other hot drinks can damage the plastic of your aligner trays, and coloured drinks like red wine can stain them. So you’ll have to budget time for meals, snacks, and drinks, and ensure that you bring along a toothbrush, toothpaste, and floss to clean your teeth afterward. Make it a game to see how close you can get to that 22-hour mark every day. You’ll hear about people who only wear their retainers at night, or who eat and drink with the trays in place. Some may leave their trays out for hours at a time and still see results. It’s okay to give yourself extra aligner-free time now and then, perhaps on the weekends when you’re out with friends or attending a party. Just make sure that you put the aligners back in as soon as possible after the event. If you leave the aligners out too long on a daily or weekly basis, it could add weeks to your treatment time. Remember, once you achieve your perfect smile, you’ll only wear the trays at night, so you’ll be able to spend all day without them, every day. Imagine flashing that perfect, plastic-free smile at everyone you meet. It will be an amazing feeling. It’s time to start the Invisalign adventure. It’s a journey that will take months to complete, but your Singapore dentist will be with you every step of the way. In fact, the entire team at Orchard Scotts Dental will cheer you on during each phase of your progress. We’ll provide support, answer questions, and help you out with comfort control. If you ever have a problem with your Invisalign trays, your dentist in Singapore will be glad to help you on short notice. Call us today to start the adventure of perfecting your smile.